Every new technology brings with its own set of challenges. And, Salesforce is no different. Whenever a business plans to move from the old technology to Salesforce, it faces certain challenges. 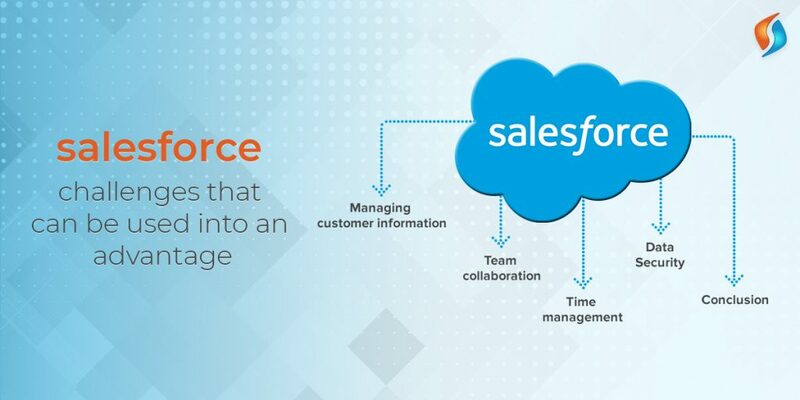 However, with the right help and reliable salesforce consulting services by your side, you can eventually transform these challenges into advantages. Customer information is the biggest asset of an organization. When dealing with such critical customer information, it can be challenging to move the entire information to a new system. And, this is where the first challenge when migrating to Salesforce comes into the picture. However, once you will migrate to the new system, this eventually will turn into your biggest advantage. With salesforce development services, all the important customer information is accessible with just a few mouse clicks. Starting from contact information to an opportunity tied to that lead – you get to see everything right there and then. This way, the biggest disadvantage turns out to be your biggest strength. After all, managing customer information is the biggest challenge for a business. Isn’t it? Without a proper system in place, it is always cumbersome to manage your team and collaborate. However, with salesforce consulting services, team collaboration becomes as easy as a breeze. You can communicate with anyone and everyone in the team in real-time, share information, get updates and do whatever is needed to bring seamless collaboration. So, what used to be an initial challenge for you before salesforce app development can eventually turn out to be something that you can use to your advantage. After all, a team that collaborates seamlessly is sure to bring good, positive results on the table. This could bring along with it business automation as well. It can be quite chaotic when so many people are working together in different teams. With so much stuff scattered around, and everyone having their own KRAs, it can be quite a tough ask to bring them all together towards a common goal and that too while sticking to strict time deadlines. This is where a good salesforce development company can bring you an advantage. As everyone in the team is available under one roof and at one platform, sharing information, assigning work and taking all the necessary action becomes seamlessly easy. You don’t really have to run everywhere looking for who need to do what and how a thing is supposed to happen. with Salesforce app development. Everything comes together in one place, saving you truckloads of time. And, as they say – time is money, so you can save a lot of money as well. What else can you ask for? With the help of a seasoned salesforce developer, you can transfer all your critical data into Salesforce without any hiccup. Salesforce, which is equipped with plenty of state of the art security features, will make sure that data security is the last thing you need to worry about. And, there are big numbers to support this claim. According to one of the researches, businesses that have migrated to salesforce consulting services have shown a 94% improvement in their Data security. These numbers say it all. Get the best Salesforce Development Company! As it is with every new technology, there are quite a few challenges a business has to face when migrating to one. Same is the case with salesforce development services. However, as said in the beginning when you have the right technology partner to support you in this voyage, you can transform these disadvantages into your strengths. And, that is what matters in the end. If you are looking for salesforce consulting services, then Signity Solutions is just the perfect place for you. Get in touch with us by dropping an email to info@signitysolutions.com and we promise to get back to you in no time. So, what are you waiting for?